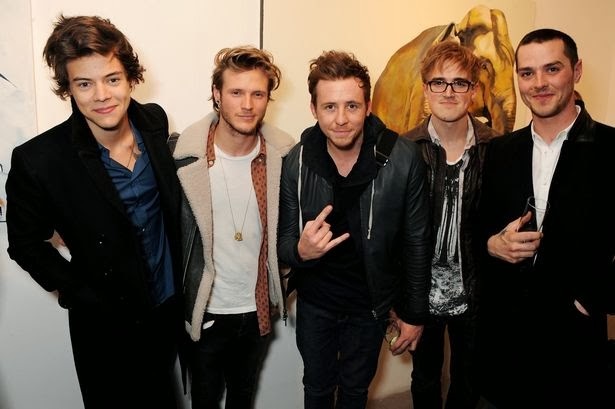 The 'Party Girl' band – Harry Judd, 27, Dougie Poynter, 25, Tom Fletcher, 28 and Danny Jones, 27 – have turned to the world conquering boy band for career and style advice. The boys opened up about their friendship with the One Direction boys – Harry Styles, Louis Tomlinson, Niall Horan, Liam Payne and Zayn Malik – whom they have written songs for in the past and whom they admire for their "genuine" nature. Dougie told New! magazine: "It's all very natural and they're very genuine. I think that's why they've exploded." Danny added: "We asked them for advice! How do you do it? How do you look so good?" The 'All About You' singers find the pressures of pop stardom a difficult way of life, but say they experienced new levels of attention when spending time with the One Direction boys. Tom said: "It's as difficult as every other job. But I'm sure there's a guy cleaning up a toilet that has a much harder life than we do." Harry agreed: "We can't complain. But when we've been with One Direction, it's another level for them." While One Direction has just finished their worldwide "Take Me Home" tour, Mcfly – who recently united with former Busted members Matt Willis and James Bourne to form supergroup McBusted – will embark on a sell-out UK tour next year.